Body length up to 6 to 8 ft. long. Color tan with reddish or white belly. 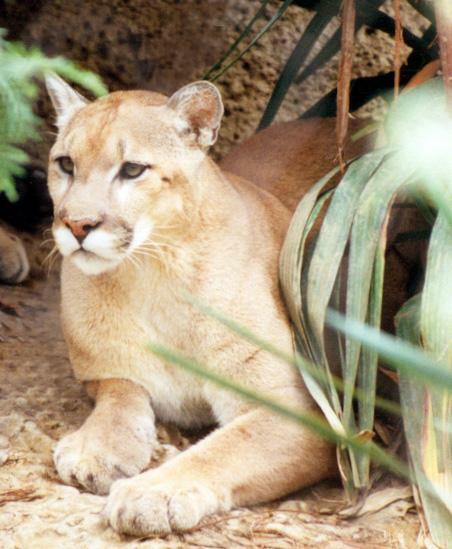 The cougar is found in most parts of the North and South America except the arctic. Its population is now dwindling and even vanishing in places where it used to be abundant. It is very territorial and solitary, avoiding even its own kind except to mate. Its prey are usually deer, sheep, goats, and other similarly sized game. Social lives of the cougar: The cougar or mountain lion lives a very solitary existence. Mountain lions are only not alone when a mother has cubs and during mating season. The mountain lion not only avoid its own kind, but human contact. Yet, the more we humans take away the land, the more humans and mountain lions will come into contact with each other. When contact is made mountain lions are known not to be aggressive and will run unless cornered or surrounded. Mountain lion litters usually have 2 to 3 cubs. The cubs are blind at birth and are very vulnerable. This weakness of the cubs makes the adult mountain lion a fierce defender of its young. This fierce defense is not only against other species of animals but its own too. In fact, more mountain lions are killed by each other, than by other animals or humans. The cougar or mountain lion can climb up and down trees. The cougar can also jump up cliffs that are up to 18 ft. tall as well cover ground with incredible speed and grace. It has a distinctive call midway between a cough or a snarl. Despite its large size it is incapable of roaring. Another special adaptation of the mountain lion is the size of their abnormally large paws and their long tail. These large feet are used for jumping great heights and their long tails are used to balance themselves on their jumps and steep edges. 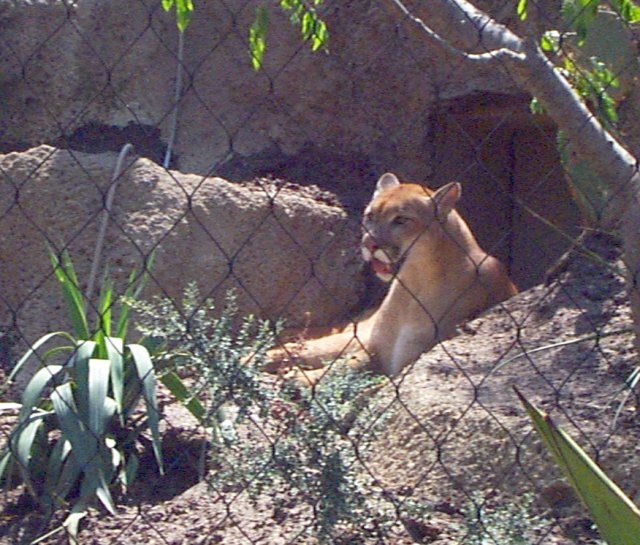 The Fort Worth Zoo mountain lions include one male and one female. The two mountain lions acted in two very different patterns when observed in captivity at Ft. Worth Zoo. The male was very curious and somewhat aggressive when released into cage. The male paced back and forth checking out his environment and the spectators viewing it. The female's behavior was very different. When she was let out of the cage she just sat in the rear corner and did not move or observe the spectators viewing the mountain lion. Zoo personnel comments: The personnel during a tour pointed out the large feet and long tail. These two special feature he said are used in the mountain lion's incredible ability to jump as well as their keen balance and agility. . The mountain lions when I first arrived had not been let out for viewing. Finally, as I was about to depart the mountain lions were let out into the viewing area. When let out the male went straight for the front of the cage and the female stood in the back of the cage away from everyone. The male was very aggressive and paced back in forth in front of the cage while the female was very docile and shy. I am not sure if this is always the behavior of mountain lion's in the wild or not, but in caged environment this is what was observed..